In this section, we will use discuss the Gatan implementation of energy-filtering and spectroscopy instrumentation. Other systems have similar controls and considerations. Before you begin an experiment, it is important to familiarize yourself with the various controls, parameters, and adjustments of the Gatan imaging filter (GIF) system. This will help you understand the basic functionality that you will use to collect energy-filtered TEM (EFTEM) images, elemental maps, and electron energy loss spectra from your transmission electron microscope (TEM) sample. The GIF entrance aperture determines what portion of the TEM beam will contribute to EFTEM images and electron energy loss spectra. Each GIF has four entrance apertures that are selectable under pneumatic control. The largest entrance aperture (5 mm – GIF Tridiem® and GIF Quantum® SE, or 9 mm – GIF Quantum ER system) you can use for all GIF imaging applications. This aperture and the TEM magnification fully determine the specimen field of view the GIF will capture. Imaging apertures for the GIF Quantum are square and are not useable for spectroscopy. The two smaller apertures (2.5 and 5 mm for GIF Quantum system) are useful for spectroscopy applications. The smallest of these apertures cut out the portion of the electron beam that contributes to small residual aberrations of the GIF prism focus (see below) and thereby helps achieve the best possible energy resolution in the electron energy loss spectra. Apertures also control the collection angle and signal intensity in electron energy loss spectroscopy (EELS) experiments. Finally, there is a special mask aperture with a precision fabricated square array of holes. Use this solely for automated tuning and alignment of your GIF. Sophisticated multipole optical elements (e.g., deflectors, quadrupoles, sextupoles) pre-­shape the beam to compensate for the residual focus errors of the GIF prism. Although complex, the fine adjustments of this multipole system are fully automated via the Tune GIF function of the Gatan Microscopy Suite® (GMS) software. The heart of the GIF is its magnetic prism. This element generates a magnetic field that bends the electron beam when it enters the GIF through 90°. This disperses the electrons along a vertical line in accordance to their energies. Zero-loss electrons, which have the most energy, are bent the least and appear at the bottom of the vertical distribution. Core-loss electrons, which have lost the most energy and are the least energetic, are bent the most and appear at the top of the distribution. The prism also acts as a lens with focusing properties. In this respect, its main function is to form a sharp (demagnified) image of the final TEM projector system crossover at the plane of the energy selection slit. The energy selection slit focuses the energy dispersed electron beam. During unfiltered imaging and spectroscopy applications, the slit is fully retracted. For EFTEM applications, the slit is inserted then the width is adjusted to select the electron energy loss range you desire in each EFTEM image. Typically, at 200 kV, the width of the energy selection varies from 2 – 100 eV, which represents a physical slit opening of 5 – 250 µm on the GIF Quantum system. While you can adjust the slit to select a variable energy range, the centroid of that energy range varies when you electron optically move the dispersed electron beam up and down relative to the slit edges. You can accomplish this in any of three ways. Spectrum offset (TEM high tension) – The spectrum offset function increases the TEM high tension by an amount equal to the average energy loss you wish to have in an EFTEM image. Primary electrons that now have a higher energy will lose energy in the sample and pass through the slit at the original ZLP energy. This is the recommended offset method for all EFTEM imaging applications. Note: This feature is not available on dedicated spectrometers. Energy shift (prism current) – The energy shift function varies the strength of the prism magnetic field when you change the current in the drive coil. This method is recommended when a large energy offset is required (up to 10 keV) and for monochromated systems operating at low (<80 kV) voltage. However, a disadvantage is that you may observe the small hysteresis in energy offset when the current varies over a large range. Therefore do not use this method for precision edge onset measurements. The prism current is also used when you adjust the energy zero of the spectrum or center the ZLP in the energy selecting slit. Drift tube voltage – This function applies a precise voltage to the drift tube that temporarily accelerates the beam as it passes through the prism, and thereby results in a net downward deflection of the dispersed beam. This method is recommended for spectroscopy (EELS) since it is more important to keep the illumination conditions (e.g., probe focus) constant in this case, especially when you work in scanning transmission electron microscope (STEM) mode. This method is suggested when you measure chemical shifts in the spectrum because the offset does not suffer from lens hysteresis. However, the drift tube voltage has a limited range (1 or 2 kV depending on the hardware options), and introduces a small defocus of the EELS spectrum at low operating voltages. After the electron beam passes through a crossover at the energy­ selection slit plane, it is projected back into either an image or a spectrum at the plane of the GIF detector. Multipole lenses between the slit and detector enable this capability. The multipole lenses are ideal due to the inherent asymmetry the prism introduces and permit optimum coupling of both image and spectral data to the pixels and natural readout directions of the CCD sensor. The multipole elements of the GIF projection system allow automated correction of image magnification and higher order distortions to sub 1% levels depending on GIF model. Also, the multipole optics allow automated correction of prism induced chromatic aberration (achromaticity). Fundamentally, you can mediate all GIF adjustments via the low level FilterControl application. This is the only program that talks directly to the GIB electronics. All other higher level software (see below) controls the GIF by messages that are sent to FilterControl. FilterControl manages all the lens programs and installation settings of the GIF optics and is normally only operated by Gatan authorized service engineers. However, some basic controls and diagnostics remain accessible to operators and may be useful in certain circumstances and operating modes. Note: For version of software before GMS 2, FilterControl runs as a separate program and must initialize before you launch the DigitalMicrograph® software. For GMS 2 and onward, FilterControl is part of the DigitalMicrograph software and can be found in the floating windows menu if the system is in power user mode. The GIF detector is based on the UltraScan® (US) 1000 CCD camera technology from Gatan. At the heart of this detector is a 2048 x 2048 pixel CCD with 14 µm square pixels and 4 active readout ports, one near each corner of the CDD. These outputs are coupled to the camera controller for rapid readout of image or spectral data captured during each exposure cycle. The camera controller program moves the charge in each quadrant of the CCD to a different readout register and is able to digitize all four outputs simultaneously, thereby able to achieve high data readout rates. Electrons projected by the GIF optics onto the detector impinge on a phosphor that emits a pulse of light for each beam electron that strikes it. A novel optical stack captures each light pulse and channels it to the immediately adjacent CCD pixels. This proprietary HCR technology from Gatan ensures that light pulses are captured with a very narrow point spread function, and thereby preserve optimum resolution in the images and electron energy loss spectra. 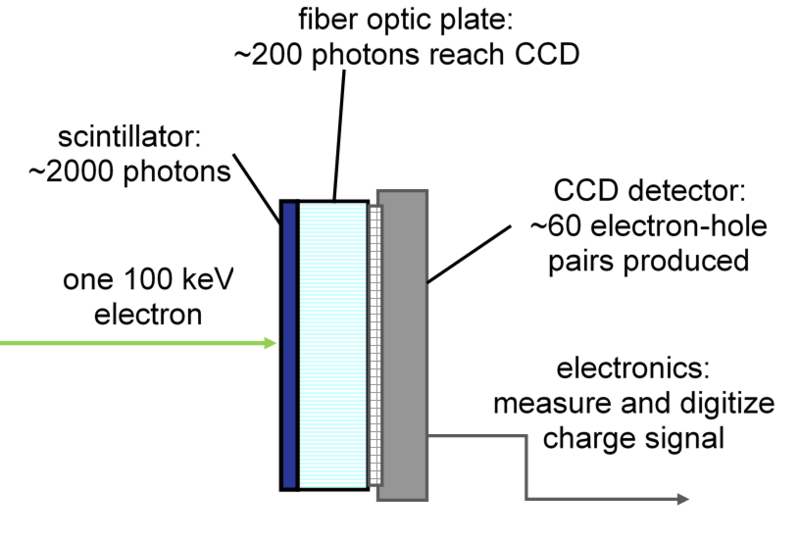 Schematic of detector stack in an EELS system. The fiber optic plate serves the dual role of faithfully transferring the image to the camera detector and also blocking high energy x-rays from reaching the detector. Strange shadows exist in the acquired images or maps. At the start of an energy-filtered transmission electron microscope (EFTEM) mapping session, or if strange shadows exist in acquired images or maps during a session, perform Tune GIF in the AutoFilter® palette and repeat. For more details refers to the tuning document. What size objective aperture should I use? The aperture size can be optimized based on the energy loss, slit width and required spatial resolution, but this is generally not necessary. You must use an aperture to limit chromatic blurring or your maps will be poor. Generally an aperture on the order of 8 – 16 mrads at 200 kV is adequate.